As our plane landed into the city lights of Lima Peru, images of the women we saw last year appeared. Excitement, fear, hope and faith consumed me. I prayed I would see the women who sometimes visited in my dreams again. Beautiful brown faces aged well before their years, from the struggle to survive, raise a family and find happiness. Their deep wide-set eyes, so warm and friendly, and their moving smiles thanked you without saying a word. I prepared myself mentally for the work ahead and prayed God would have mercy on us all. Our early morning bus ride to the clinic was always spiritual. The small villages were surrounded by valleys of sun-kissed mountains and blue sky. You felt blessed to be amongst its presence. The clinic is made up of green painted shacks signifying life, growth, renewal, and health. Everything the system lacks. Every morning we would be greeted by hundreds of women waiting with anticipation, their young children on their backs, clapping as our bus drove into the square. Setting up the patient rooms, I would realize how much we took for granted. The beds were hard, plastic stirrups attached to the side in one position, not practical for arthritic hips. The speculums were ice cold, just like the bare rooms. I was surprised how the women would lay on soiled bed sheets, before we could change them. As each woman entered the room, I admired their beautiful dresses and hats, representing years of oppression. I wondered what lives they led and if they were happy. They had a presence beyond the clothing they wore. Their spirit came across quickly. They were cheerful and sad at the same time. Some had experienced hard deliveries, the scars of birth trauma, making basic anatomy difficult. Most complained of pelvic pain, compliments of years of untreated sexually transmitted diseases. I could see their eyes tear when we listened to them and took the time to hug them as they left the room. This reminded me that medicine begins with healing the soul. 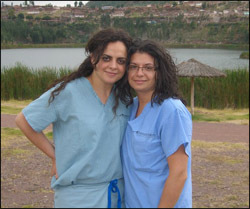 I also learned from the amazing volunteers, a group of physicians, nurses, medical students and family of health care workers, who gave of themselves completely. They spend every waking minute committed and continue to work on their behalf now. Their generosity and kindness permeates this. I thank them all for their foresight, patience, and guidance. This would not be possible without you. Everyday as we left I would look at the children, especially the girls. I hoped that all of this would somehow cause a slight turn in their fate. As the sun set over the mountains and the night covered the day, the playground outside the clinic reminded me that there had been moments of beauty. As the bus drove away, I knew I had left a better friend, companion, guardian, sister and doctor. A sensation of abundant peace washed over me, knowing that they had felt loved. 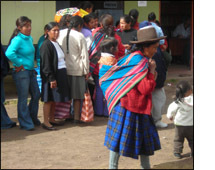 Established in 2006, the INCCA Foundation is committed to improving the health and quality of life of Peruvian women through the primary and secondary prevention of female genital tract cancers, including cervical cancer. Our preventative efforts are aimed at reducing morbidity and mortality from these cancers, especially in women with limited economic resources. This mission will be achieved through the delivery of medical services dedicated to the early detection, diagnosis, and treatment of pre-cancers of the female genital tract. In the past two years we have treated over 2,000 women.